BERLIN, Dec 12 2012 (IPS) - When the Desertec Industrial Initiative (DII), an alliance of 21 major European corporations, first unveiled plans to install a network of solar thermal, photovoltaic, and wind plants across the North African Maghreb region to generate electricity, the project was greeted as a ‘green utopia’. Expected to generate 100 gigawatts by 2050, the project demanded an investment of 400 billion euros. In a study released last summer, Desertec predicted that an integrated power system for Europe, the Middle East and North Africa would allow Europe to meet its carbon dioxide (CO2) emissions reduction target of 95 percent in the power sector by importing up to 20 percent of its electricity from the Maghreb, thus saving 33 billion euros per year. Meanwhile, the project would enable Middle Eastern and North African countries to meet their own energy needs using the abundant solar and wind resources in the region, and achieve 50 percent of CO2 reductions in the power sector despite a massive increase in demand. The region would benefit from an export industry worth up to 63 billion euros per year. Now, three years since the project was announced, the Desertec dream is yet to be realised, and euphoria has given way to harsh criticisms ranging from accusations of incompetence to shortfalls in corporate governance. The project has been nicknamed “desperate tec” by internal staff members discontent with its trajectory. Indeed, every square kilometre of land in MENA “receives an amount of solar energy that is equivalent to 1.5 million barrels of crude oil. A concentrating solar collector field with the size of Lake Nasser in Egypt (Aswan), of some 6,000 square kilometres, could harvest energy equivalent to the present Middle East oil production”. Morocco, which will host the pilot project, has been especially keen to see the venture come to fruition, since it will have a huge impact on the local economy, particularly with regard to job creation in the renewables sector. Back in 2009, ‘green networks’ were created in several cities around the kingdom, including in Casablanca. Comprised of small firms run by young professionals, these networks were designed to create the necessary infrastructure for the project. “We have created companies, received training, but in reality nothing has happened yet,” Abdellah Benjdi, one of the young company heads, told IPS. Ordinary citizens suffering from astronomical electricity bills in Morocco are eagerly awaiting the so-called ‘green utopia’. But by all indications, their patience is not about to be rewarded. Experts first received confirmation of Desertec’s difficulties on Nov. 7 in Berlin, during the official presentation of the first solar thermal, photovoltaic and wind plants to be installed in the southern-central Moroccan province of Ouarzazate, which are scheduled to deliver electricity by 2014. Although construction plans have technically been sealed, they still depend on Spanish approval – Spain being the primary partner in the project – to allow the electricity generated at the site to be transported to Europe. The Spanish government, battered by a grave economic recession, has so far been unable to confirm its support for the project, a situation that is unlikely to change given that Spain is a net exporter of electricity to Morocco and would not like to see this trend reversed by successful implementation of the pilot project in Ouarzazate, experts say. The DII alliance includes the leading German Deutsche Bank and the Spanish transmission agent and grid operator, TSO Red Eléctrica. “The business case for a Desertec Reference Project, prepared by (us) and the Moroccan Solar Agency Masen, has been extensively discussed for the past two years with Spanish companies, the TSO Red Eléctrica and the European Commission, and declared feasible,” DII CEO Paul van Son said during the presentation in Berlin. The first project in Morocco led by the German energy giant RWE would comprise an installed capacity of 100 megawatts of photovoltaic and wind power. 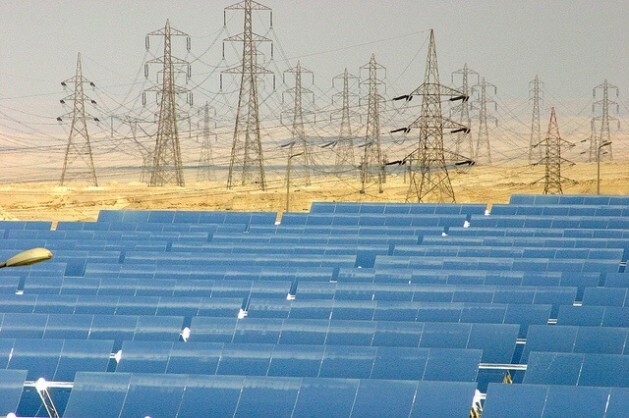 A second project, using solar thermal plants and overseen by Saudi Arabia’s ACWA Power International, will have an installed capacity of 160 megawatts. Both plants are expected to be functional by 2014. Van Son confirmed, “Investors have been found, initial subsidies are available, and industry wants to get involved.” But Spain refused to send representatives to the presentation in Berlin, and has so far failed to undersign the Morocco project. Van Son is convinced that “the other partners in this negotiation, from Morocco and the EU, will be able to convince Spain,” since the Spanish government, too, stands to benefit from the project. But Spain’s refusal is just one example of the enormous political, technical and financial coordination hurdles the venture must overcome. Another indication of these difficulties came in late October, when the German electronics giant Siemens announced its withdrawal from the alliance, despite being a founding member of the DII back in 2009. This move has been widely interpreted as proof that Desertec is failing. According to Friedrich Fuehr, founding member of the board of directors at the Desertec Foundation, the DII “has been following the wrong strategy”. Fuehr told IPS that DII’s main responsibility since 2009 was to conceive a political roadmap that could overcome all international coordination difficulties and solve the pressing questions of how subsidies and taxes would be implemented. Fuehr, a prestigious German lawyer and business consultant, said that “a coalition of such powerful and capable private companies such as the Deutsche Bank, UniCredit, RWE and SCHOTT Solar should be able to formulate within three years the political framework they need to make Desertec come true”. Fuehr lamented that the energy revolution the world needs in order to confront the realities of global warming “is already happening. But Desertec is not involved in it”. *Abderrahim El Ouali contributed to this report from Casablanca.